«©NCS» The year was 1999 and Capcom brought gaming terror to the Playstation once again in the form of Biohazard 3. Gone was the cramped quarters of a mansion in the middle of nowhere and the Raccoon City police Dept - the new killing fields of BH3 took place in the forlorn environs of Raccoon City itself. That's where Jill Valentine did her thing and shot down hordes of lumbering undead. NCS recalls a fairly good amount of merchandising that tied into the Biohazard 3 fervor back in '99. 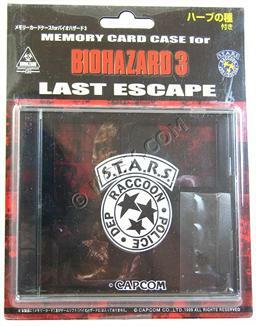 One bout of merchandise was Hori's officially licensed Biohazard 3 Memory Card Case which stores four Playstation memory cards safely within a CD jewel case with mounting retainer. The front and back of the case features the S.T.A.R.S. Raccoon Police Dep logo along with the Capcom logo below it. As a bonus for buyers, Hori also included a little pack of seeds so you can grow some herb. Not that herb but "healing herbs" so you can recover your health and vitality just like Jill. Sort of. The seeds are actually basil seeds which probably won't germinate since they're a decade old. Orders are welcome to ship today. All stock is new from NCS' inventory but please be advised that there is some slight scuffing of the plastic tray that serves as the front shielding for the packaging. The cardboard backing however looks good and is still rigid and somewhat glossy. Each Biohazard 3 Memory Card Case is priced at US$14.90 + shipping. For our domestic customers, we recommend shipping by normal USPS Media Mail Service which is about $2.50. International players can select USPS First Class Airmail which is approximately US$10. This document and photos are ©NCSX 1999, 2009. All rights reserved. No reproduction in whole or in part of this document may be made without express written consent of National Console Support, Inc. The Biohazard 4 umbrellas were originally released with the Japanese Playstation 2 version of the game in 2005. For collector's who need to own everything related to the Biohazard franchise, here's your chance to pick up a copy of the Japanese PSP UMD-Video at a nearly 50% discount. I buy two of the cases last year and the seeds grow to become plants in my garden. Very perfect.